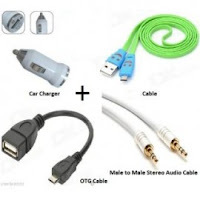 Hello Frndzzz.... www.dealsnloot.com Again Back With New Loot Deal.you can buy Combo Pack of OTG + Charging Cable For Mobile + Car Mobile Charger + Audio Cable worth Rs.199 at Rs.99 with free shipping. To steal this combo pack . It’s a perfect combo for all you car needs from charging to transfer of data from your mobile during travelling .